Where may I find the secret shop? I love your hack. It's frustrating in a good way on HM. Thanks for all the hard work you put into it even though you've got a lot on your plate with other matters. Like with The Lion Throne man..I have to rush so much and get destroyed for it. I had to though for that sweet hero crest; I skipped a lot of treasure for it except the knight's crest. Haha also that feeling of feeling so poor. I always get chests and stealables in other games but sometimes not in this one. Do you have a file with the growth rates also? Thanks again. 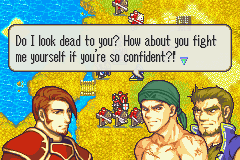 Also how good is Ephraim's prf in your hack? I wasn't able to finish the chapter fast enough. You put so many stealable promotion items I lost a lot of time setting up my thieves. I'm pretty sure there is a list of how to recruit everyone in the first post. Secret shops are found on the same tile any unit with a member card starts from. I thought I made the Download come with growth rates. Regardless, the next release (whenever that may be) will have that patch that lets you view your characters growth rates in game. The next update is going to be the first six chapters of the game with the new skill system stuff in place. Awhile back, I decided I'd try and remake some of the hack, but after not being able to work on this for so long and having other stuff I wanted to do, I realized that wasn't feasible, so I just went back to porting over what I had already done with some new tweaks and updates. I think that's everything. Don't need to make anymore maps, animations, mugs, skills, etc. When I'm done porting everything, maybe I'll ask for some help getting this hack done since I'm just so close to finishing. We'll see. 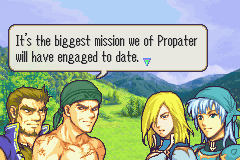 That's exciting Blademaster. Is the current HM balanced or still not? I'm having a super tough time in Ch. 10 at the moment. I'm looking forward to it, thanks again for making the game given your schedule. It's not balanced. I might not ever really balance it if it's challenging and there's nothing unfair to it. Enemies are too accurate and hit too hard especially archers but I can live with it. Getting the map clears in time is a pain too but it comes with the territory. I wouldn't mind though, it feels really good to just get through at times. 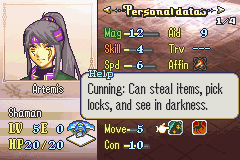 What I really like is there isn't really any point so far where I can just use a carry or carry units. Lots of units have got to contribute and it's a huge risk to attack enemies when at wtd. Do you personally make Roa into a flier or do you make him a dragoon when you yourself play? Roa is a shaman in the current unreleased build and has been for awhile, so I wouldn't remember. Hey, first of all I just want to say I loved your hack! You're implementation of turn based clear rewards and multiple side objectives and powerful stealables forces the player to really plan out their route before deployment to get everything. This made each map feel like a puzzle the player has to solve and allows the player to make decisions about how hard they want to make each map for themselves. For example do you really want the gold gem held by the cyclops in chapter 10 or would you prefer to have an easier time beating the fast turn objective? I also liked how the fast clear rewards, for the early maps in particular, were helpful right away in the following chapter ex. 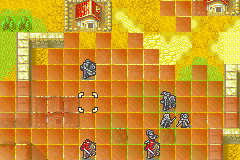 giving the player a horseslayer and having a lot of cavs in the next chapter. There were a couple things I didn't like so much as well. At times, certain maps felt a little reinforcement heavy when the reinforcements didn't seem to be there for a particular reason. 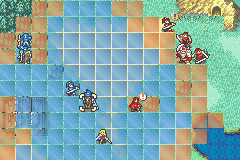 For example the in fog of war map with Elliot, the reinforcements kept coming for at least two turns longer than I felt like they should, making what is already a bit of a slog of a chapter more of a grind than it needed to be. 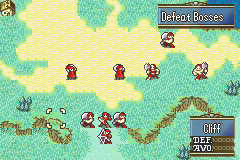 On the maps with fast turn clear rewards I thought the reinforcements were for the most part done well, but since there was no fast clear reward for the FoW map it just felt tedious. 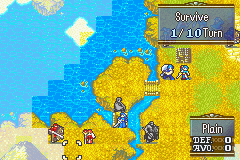 In addition, in some of the maps with fast turn clear rewards it felt kind of odd to me to incentivize the player to clear the map quickly but then have several turns of reinforcements spawn right around the objective, I'm thinking of chapter 10 in particular. I guess you could view these as adding to the difficulty but personally I think it would add more to the challenge without frustrating the player by having them spawn elsewhere in the map and perhaps harry they player on the way to the objective. Just to be clear, I have no problem with a troop of reinforcements spawning to guard the boss/seize point but when multiple waves come its kind of annoying. I also found it difficult to keep track of all the npc enemies and how they were related even after reading through the Corrupt Theocracy lp you mentioned. 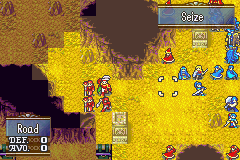 I noticed a few bugs on my playthroughl, on the chapter with the summoner ( I think it's 11 or 12) on the first enemy phase after summoning phantoms another generic npc located 2 spaces below the summoner had their map sprite suddenly change to part of a phantoms sprite and another small piece of the sprite appeared in the space beneath that unit. 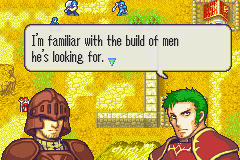 When checking the unit's description it was still as it was before just the map sprite that changed. After promoting unit's in the battle preparation screen they started the chapter missing the hp from their promo gains, ex. 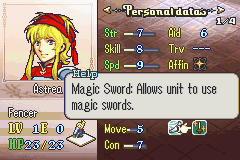 after promoting Artemis she started the chapter with 28/32 hp. 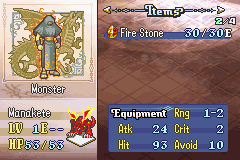 Finally, in chapter 13 Malik's bolting tome doesn't lose uses after he attacks, he used bolting at least 3 times but still appeared to have 5/5 uses remaining, is he intended to have unlimited uses? Not sure if these have been fixed already in your working version but I figured I'd share them just in case! Thanks for putting some much hard work into this project, this is by far the most fun I've had playing a hack and I can't wait for more chapters to be released! Glad you liked it and thank you for the feed back. I believe the issues you've brought up in the FOW chapter have been addressed. As for the bugs, they should all be fixed but probably not the HP one. 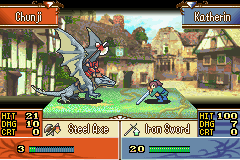 Bosses are meant to have infinite uses in their weapons. I'll keep your chapter 10 criticism in mind when I revisit it. SGW V2 Release one is finally here. It contains the first six chapters, the prologue through chapter 5. Please let me know if you find any bugs not mentioned in the readme. Hopefully I'll be able to get the next few chapters ported over quickly for the next release. So exciting ! This was one of my favourite hacks and I'm happy to see your working on it again, implementing some of the new ideas developed since you began this project ! Will definitely play ! She isn't available in the current patch and won't be until V2.2. In the old patch, you recruit her automatically if you do not kill Dario in chapter 9. 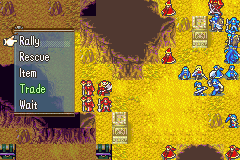 If you do kill Dario, you recruit Clea instead. Edited March 7, 2018 by Blademaster! Evan, I gotta say you made an intense character. 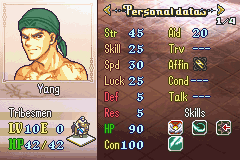 Automatic 15+ crit and that Debuff, wow. 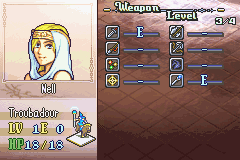 The weapon rank might be wonky since two or more of the characters havent progress in their weapons for me, but otherwise its very great that you manage to continue working on your hack. 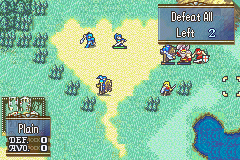 Chapter 5, where you face the dragons, is the last chapter of the current patch. My goal is to have the next patch (up to chapter 13) ready by April 14th, the anniversary of the thread. I don't really have much to update with since the screens are typically the same as the ones posted in the thread before. I added and moved around some classes, so when the next patch is released, it's probably for the best to start over, but this won't be 100% necessary (the biggest change is that Yin starts off in Tier 3 now as far as I remember). At the pace I'm going, I'm not sure if I'll be able to reach my release goal for next month, but I'll try. 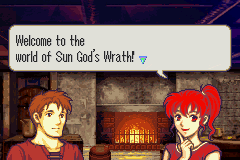 I see that there's bits from Breath of Fire and Golden Sun, which i really really like. Most certainly a fan of this hack! Real life has been pretty rough this past week. Didn't have much time to work on anything, so I won't be able to reach my initial goal for the anniversary. Sorry! Take your time Blade, hope things get better for you. Your hack is one of my favorites; quality can wait and focus on yourself first. Ulysses, Katherin, Nicole and Baryl are my favorites. 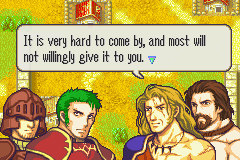 I hope they stay how you made them; Ulysses especially bailed me out on HM so many times since he's so tanky. May i have ur premission to record corrupt theocracy on my new youtube channel? @Blademaster! I don't see why you'd need permission or want to torture yourself playing Corrupt Theocracy, but sure go for it. Also, please PM me questions about Corrupt Theocracy. This isn't a thread for it, even if the two are related.